Listen: Justine Toh and Simon Smart chat with Laura Bennett about Christianity’s worst moments. It’s hard to deny that Christianity has contributed great good around the world, in the centuries since Jesus walked the earth. But the faith also carries a very embarrassing list of ugly episodes in its history—episodes that believers have to acknowledge, if they’re going to defend their faith properly. Things like the Crusades, the Medieval Inquisitions, the church’s failure to stand up to Hitler, their support of slavery, hoarding of wealth and oppression of the poor, are just some of the sins of the faithful. The team at the Centre for Public Christianity (CPX) often receive emails from irate media watchers about this laundry list of evils. That’s why they’ve decided to tackle it head-on, in a documentary called For the Love of God. The new film – now showing in over 100 cinema screenings that have sold over 8,000 tickets so far – pulls no punches in addressing some of the Christian church’s worst moments. The trailer begins with the searing honesty of theologian Professor John Lennox, saying he is “utterly ashamed” of some of the sins committed in the name of Christianity; and CPX director John Dickson describing how the crusaders “slaughtered men, women and children”. Aptly, the film is subtitled, How the Church is Better and Worse Than you Ever Imagined. In an interview with Hope 103.2, CPX’s Justine Toh and Simon Smart said it’s important for modern Christians to know the ugly parts of their faith’s history, not just the glowing parts. “It’s like [asking] ‘where did I come from’ and then finding out your parents got up to all sorts of horrible things, so it’s like a loss of innocence,” Justine told Laura Bennett. 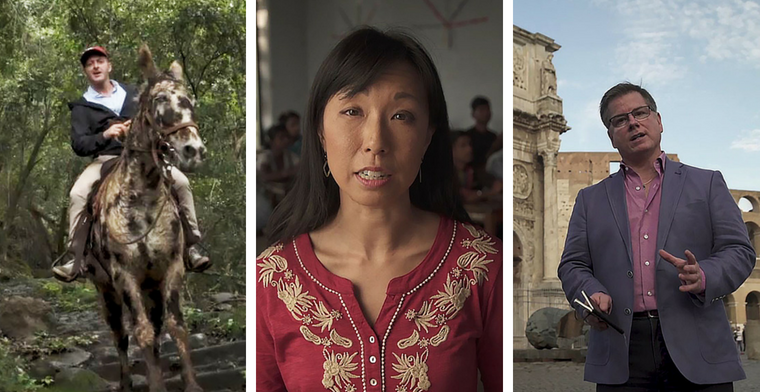 Above: Simon Smart on location in Hawaii, Justine Toh in India, John Dickson in Rome. In their interview, Simon and Justine touched on a number of dark points in Christian history, including the Crusades of medieval period— religious wars in which Christians from the Latin church were recruited into a bloody, murderous attack against Muslims. “There’s a lot of reasons why they happened,” Justine said. “But the first Crusade started off because Pope Urban was appealed to by Christians in the East who were under attack by Muslim forces. And he pitched it as ‘Western Christians need to go and save our Eastern brothers and sisters’. “The people who went on crusade weren’t theologians, weren’t well read, but they could fight. It was a way of saying ‘use your skills in order to serve the church and by doing so you gain automatic entry to heaven, you can atone for your sins’. There is a co-opting of peoples’ violence for a religious cause. 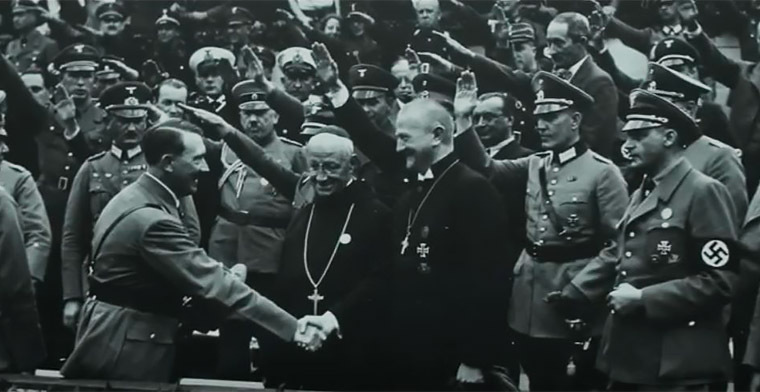 Above: Many Church leaders supported Hitler during his reign. The pair also talked to Hope 103.2 about the church’s silence during the Holocaust, which Simon describes as a “terrible story of complicity, and capitulation”—as well as the rare, courageous voices of dissent. “It’s not a great chapter in church history,” he said. “A lot of the leaders, some of the theologians, were enthusiastic supporters, literally waving the flag in support of the Nazis, and they sort of found a way to twist their theology such that it would elevate the status of the Nazi call. “But there were some very prominent, very important people who resisted that. The story we tell is that of Dietrich Bonhoeffer…who was almost alone in really criticising this program he saw unfolding, and saw it as complete idolatry. 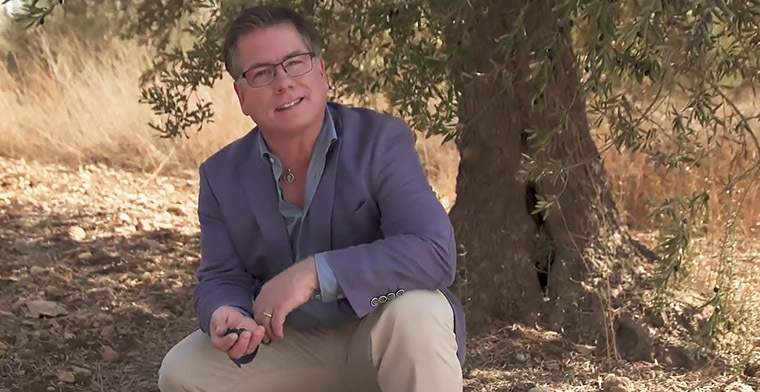 Above: John Dickson on location in Israel. The documentary also covers off painful topics like the Witch Hunts, and the religious conflict known as the ‘Troubles’ in Northern Ireland—but also many honourable stories, about martyrs and missionaries, the work of Mother Theresa, and peaceful Christian protest through the centuries. The good news for Christianity is that, despite its failures, it’s contributed a lot of great good to the world, too. For the Love of God spends a lot of time talking about how Christian faith has shaped Western society’s views on the value of about human life. “Generally we could just go into the street right now and ask people ‘is human life valuable’ and everybody is going to say yes,” said Justine. “That is a remarkable achievement. That’s not the case for a lot of human history and other places in the world today. Christian values have been the foundation for many functions in society that we now take for granted, like charity, public education, literacy, hospitals, and care for the poor. A series of screenings of the cinema-length cut is now being rolled out across Australia, with each screening followed by a Q&A session with the filmmakers. On July 1st, a series of four 50-minute episodes, featuring even more material, will be released digitally. For full details, as well as curriculum material for schools and small groups, see the betterandworse.film website from July 1.